Saami is an 18 year old asylum seeker living in London. He is from Kandahar, Afghanistan. He is a talented storyteller. Saami left Afghanistan a year and a half ago. In this page, Saami will tell us about textiles in Afghanistan, from his Kandahari perspective. When Alice Kettle first met Saami, she was amazed to find out that his family were such talented embroiderers, and at how much Saami knew about textiles. Through working together, Alice and Saami have commissioned Saami’s family in Khandahar to make an artwork, which will be exhibited in the Whitworth gallery exhibition this autumn. Saami helped to design this piece. The Kandahar Province is in the South of Afghanistan, close to the border with Pakistan. Kandahar City is the second biggest city in Afghanistan. The name of the Kandahar region comes from ‘Kand’ meaning sweet and ‘har’ meaning necklace. Some people say this partly because the language sounds sweet. ‘Kand’ can also mean chocolate! Some of the words used are Pashtu words – the language spoken in this region of Afghanistan. There are three main types of embroidery in Afghanistan: kandahari, kochi and uzbaki. Here we will discuss the three types: who wears them, who makes them, and what they look like. We will also discuss some different style textiles caps worn by men in Afghanistan. “Khamak” means sewing. This is the name of the embroidery is made in Kandahar. Some people call khamak “kandahari kar” which means ‘Kandahar’s work’. However, local people in Kandahar refer to this style as “khamak”. This style of embroidery is only worn by men. It is most commonly used to decorate the front panel of a man’s shirt. One common style is called ‘Shah baz’ – ‘Shah’ means ‘king’, ‘Baz’ means ‘eagle’. In Kandahar, people call this style ‘Shah bazi’. 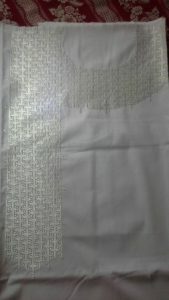 This describes a shirt with a panel of khamak embroidery on the right side of the chest. The right side bears symbolic significance in Afghanistan, which is represented in reading (right – left) and bears religious significance. In general, fine khamak will be worn for special occasions such as an Eid party. The first image below was made by Saami’s cousin and was sent to him by his mother for Eid. Of course, some individuals may wear khamak every day, as it depends on each individual’s lifestyle, but most commonly it would be saved for special occasions. Khamak is a very delicate style of hand embroidery, made using a very thin needle. It is replicable by machine, although the quality is less good. It is usually stitched by women, although machine made khamak can be made by both men and women. There are a wide range of different geometric patterns which can be stitched. These patterns are memorised and passed down through families. Saami’s cousin, for instance, remembers roughly 25 different patterns. One such pattern is named ‘pattanus’ which means ‘tray’. Another pattern is called ‘Gul’, which means flower. This pattern does not look exactly like a real flower, but is a geometric floral representation. Some other patterns are called ‘Awa’; ‘ghamai’ (diamond); ’bus’ (bus); ‘busi ghamai’ (bus diamond); ‘punjaka’; ‘laise’; ‘isada’; and ‘koknaar’. Pictures can be seen below. In the video below, we can see Saami’s cousin stitching ‘nimakai ghamai’ (half diamond). The second style of hand stitching in Afghanistan is called ‘kochi’, and is made by the kochi people. The Kochi people come from the mountains in the north of Afghanistan. They are nomadic people, whose name translates roughly as ‘coach’ – indicating that they move from one place to another. They usually live in tents, and their textiles uses wools and thicker materials to protect them from the colder climate of the north. Kochi clothing, unlike khamak, is often worn by women as well as by men. The kochi people make brightly coloured and densely patterned dresses, scarves, waistcoats and caps. The dresses are long with wide skirts, to keep the kochi people warm under many folds of cloth on their long journeys. Kochi clothing is also very popular among Indian people – singers often wear it for performances, and it is shown in shops and galleries across India. People from Kandahar tend to buy kochi clothing for women to wear on their engagement night, and young girls also wear kochi dresses. It can be made by machine, but as with khamak, the hand embroidered version is the highest quality and is very prized, beautiful and expensive. It is made using a thick needle. If made by hand, it is made by women, although men are able to make this style when made using machines. The Uzbaki people came from Uzbekistan to Afghanistan many years ago. They have settled in the north of Afghanistan. The Uzbaki people are famous for making beautiful carpets, as well as making caps for men and dresses for women. As they live in the colder northern areas, the fabrics of their clothes reflect this climate, again using wools and cottons. The big carpets for which they are perhaps most famous are called “ghali”. Men in Kandahar occasionally wear Uzbaki caps. The carpets, caps and dresses are always made by hand, and are made by both men and by women. Men cannot not wear silk or gold – these materials are considered to be only for women. Whilst men can buy and sell these materials, they cannot wear them. Women are considered to be more beautiful than men, and so these fine materials are saved for them. However, men wear precious or semi precious stones whilst women don’t tend to. When living in Afghanistan, Saami used to wear four different kinds of cap: uzbaki; balochi; kandahari and faroqi. We have already heard about the Uzbaki style – now we will hear about the next three. The Balochi cap is made is Kandahar, in Kabul, and in many other areas of Afghanistan. There are two kinds of balochi cap – the simple balochi and the Kandahari balochi cap. Whilst the simple balochi is made by hand, and is cheap to buy, the Kandahari balochi is decorative and more costly. Unlike the simple balochi cap, the kandahari variety is adorned in coloured gems. These would normally be worn on special occasions and celebratory days such as weddings and festivals. The second kandahari cap is made using two small steel sticks which are called ‘qurraishnil’. They can only be made by Kandahari women. It is made using what we call ‘chemical thread’: ‘laylooni thread’. The Faroqi cap is made outside Afghanistan. Saami’s family make a lot of textiles – particularly khamak. More than eight members of Saami’s family do khamak. It usually takes about three months to complete one garment in this style, when made by hand, and it is usually made by the women for their men, often working alone at home to complete each garment. In Saami’s family, it would usually be his mother who would make clothing with khamak on it for him, although his cousins and aunts may also make this for him. Saami’s mother learnt to make this style embroidery from her mother, and so the traditions are passed down through families. Saami’s mother would also knit warm jackets for him and his siblings to wear in the cold. It is unusual for men to sew by hand in Afghanistan. Saami, however, is able to sew thanks to carefully observing his mother and cousins sewing as he grew up. We have been discussing colours for a potential future collaboration with Saami. Through this discussion, Saami chose the colours of blue and brown. We talked about these colours further, and Saami explained why he is drawn to them. He grew up in the country side of Afghanistan, surrounded by mountains and small villages – frequently exploring the mountains with friends or on solo expeditions. When he thinks of these trips, he is reminded of blue and brown: the dusty mountains against the blue sky. The colour blue also reminds him of the blue colour in the eyes of many Afghani people, whose blue eyes are contrasted against the colour of their skin. Saami’s cousins have beautiful blue eyes – like the eyes of the famous Sharbat Gula – who appeared on the cover of National Geographic when photographed in a refugee camp in the nineties. She has come to be an icon of Afghanistan, and is considered by many to have the most beautiful eyes in the world. The colour white bears further significance for Saami, as it is considered to be a spiritual colour and represents closeness to God, and purity. 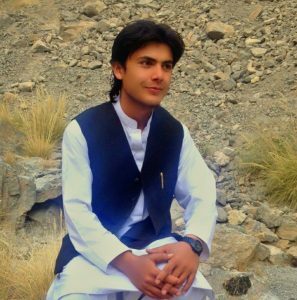 It is unusual for young people in Afghanistan to wear white often, however Saami chose to wear only white for 6/7 years before leaving Afghanistan. Thank you to Saami’s family who provided us with the following photographs and videos, many of which shows the embroidery made by the talented family.